While on a recent road trip, I had the occasion to want to add text to a photo. There are lots of apps to do this on the App Store, but I had happened to download Inkpad just before leaving, and took a look at it. My example is not nearly as interesting as the examples on the Inkpad review page, but I thought it pretty cool. After drawing a path, you can add text to it. Then, I added a seventies gradient: yellow to orange. 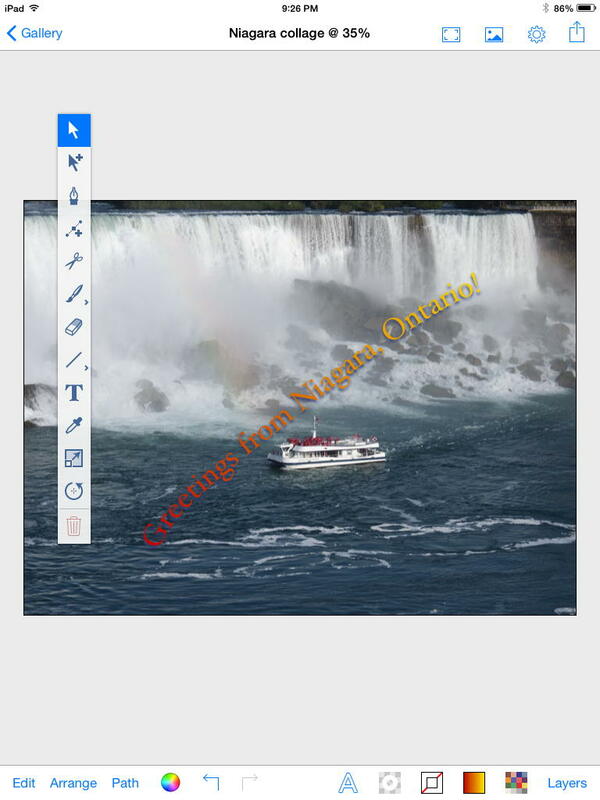 The point in my case was to make a cheesy postcard (using Bill Atkinson’s PhotoCard, but Inkpad is capable of a lot more than that. It’s a full SVG app with layers. You can create drawings from scratch, or import photos and draw over them. When you’re done, you can export to the usual places (Facebook, Twitter, Photo album) as well as to PNG, PDF, or SVG. You can see the toolbar in the photo; it has most of the standard tools: pen, brush, eraser, straight lines (which includes polygons), and so on. It can also align and distribute objects, undo and redo, choose from a multitude of fonts, adjust shadow and opacity, edit stroke and fill, and snap to points, edges, and grids. It’s an impressive tool to keep available on the road. The iPad has come a long way; our road trip was six weeks long and I only missed having a laptop once, and that was unrelated to real work.1 Blogging, writer, programming, recording, image editing and creation, desktop publishing, there’s an app for it and the app works great! Besides Inkpad, their Brushes is also interesting, but I haven’t had a chance to play with it much yet. The SD card in my camera went bad, and I wanted to get the photos off as soon as possible. So I had to use my girlfriend’s laptop for that. Looks like there’s a minor renaissance in programming languages on the iPhone and iPad. HotPaw BASIC is one of the first. Apps for the iPhone and iPad that make doing things incredibly easier. Must-have iPad app: Inkpad last modified July 10th, 2014.